As always with Weapons Locker articles, we are interested in *fiction*, with an emphasis on comic books – but also on action movies and video games, since those media do the heavy lifting in shaping perception of firearms. Though the lead writer happens to have military training, we’re not here to discuss real-world firearms and their use. Furthermore, it is centred on American fiction, since this is the one that floods the world over – and feeds on conventions developed elsewhere, such as Hong Kong action movies of the 1990s. 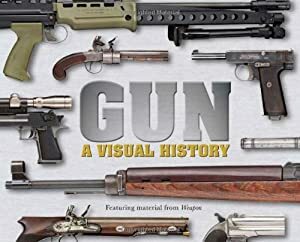 As noted above, and as heavily emphasised through the article, this text is about firearms as depicted in comics books, action movies and video games plus some related genres like pulp novels. This is all about fictional things. It’s not meant to cover anything like real world weapons, which behave differently, and makes no claim whatsoever about realism. Some less-than-lethal weapons are listed in the other Weapons Locker Modern Firearms articles – particularly grenades and speciality ammunition. Many weapons use reference special rules — for instance Long Reload or Autofire in DCH, or Armour-Piercing or Shotgun Blast in DCA. See the corresponding New Rules Files for each game system. Tasers (a name stemming from the commodification of the Taser® brand) shoot a conductive needle into the target. The needle is linked by a wire to the weapon, and this wire is used to conduct a strong electrical discharge to incapacitate the person. In the real world, tasers are a complicated tool. They require well-trained, professional officers and strict spectrum of force engagement rules lest they become little more than electrical torture devices. However in most fiction, tasers are a knockout ray – point, shoot, render target unconscious for several hours within a few seconds. The stats below model the fictional version. Tasers usually carry two needles and can thus shoot twice. Newer models have laser sights, which are frequently featured in fiction to help visualise the action. DCH Taser pistol [BODY 01, Lightning: 04, Range: 02, Ammo: 02, R#3, Limitation: Lightning has no Range – use the listed Range instead, Drawback: Very long reload time]. M&M Taser pistol [Ranged Affliction 6 (Daze/Stun/Incapacitate, resisted by Fortitude), Diminished Range 3, Limited 1 (Two shots)]. The stats do not include a mechanic regarding the necessity to penetrate the skin before delivering a shock – with the numbers given here, it wouldn’t change much in practice. 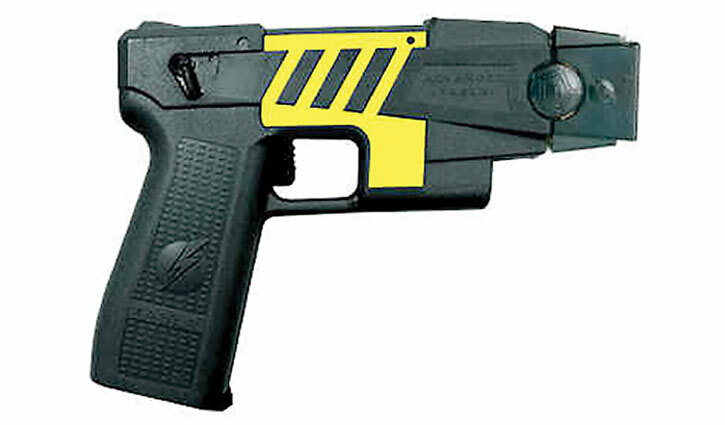 Below is a Taser International M26 pistol (photo by the manufacturer). This weapon also has a stun gun mode – as long as it has one or more Ammo left, it can be used to attack in melee without expanding Ammo, by poking the opponent with the muzzle and having it emit an electric arc. A comic book weapon intended to take down superhumans. These weapons are usually produced in small quantities to equip specialised SWAT and military operators, and can vary from carbine-sized to shoulder-fired. The efficiency of these weapons is variable. Sometime they do not help at all, sometimes they’re the plot device that explains how the highly durable and/or regenerative hero gets captured. The stats below are a murky compromise, which will take down even very tough humans but are not going to work very well on super-durable superhumans. Another variable is the number of officers, military police, etc. arranging to simultaneously shoot their target with their super-tasers. This is one of the few cases where GMs can allow mooks to gain full bonuses for team tactics, since it’s generally depicted as working well. DCH Super-taser [BODY 01, Lightning: 08, Range: 02, Ammo: 01, R#3, Limitation: Lightning has no Range – use the listed Range instead, Drawback: Very long reload time]. M&M Super-taser [Ranged Affliction 11 (Daze/Stun/Incapacitate, resisted by Fortitude), Diminished Range 3, Limited 1 (One shot)]. Here’s an imaginary design, which is a bit on the hefty side to suggest stopping power. With three launch tubes and a heavy, removable electrical feed pack, it presumably has a higher ammo capacity than the model in the stats above. A handgun firing a chemical delivery dart filled with a tranquillising drug. In real life these are used to approach dangerous animals. Fire at the beast, wait for the drug to finally take effect, make sure the animal is indeed knocked out, then do your business (veterinary medicine, putting a tracer on the animal, capture…). In fiction the effects are much quicker. Like tasers a fictional tranq pistol is essentially a phaser set to stun, with the drug taking effect in seconds. Such weapons generally are air pistols, and are depicted as being pretty quiet. Not silent either, but they have a modest report that is often difficult to locate. In comic books tranq pistols are generally sufficient to knock out any human being. Superhumans will normally resist the drug while the shooter swears that there’s enough drug to knock out a rhino, any 3 elephants, a herd of wolvertons, or something equally hyperbolic. DCH Tranq pistol [BODY 02, Poison touch: 07, Range: 03, Ammo: 05, R#03, Thief (Stealth): 01, Limitation: Thief only to muffle the shots]. M&M Tranq pistol [Ranged Affliction 8 (Fatigued/Exhausted/Asleep), Resistible (Toughness and Fortitude), Diminished Range 3]. The gun below is a Pneu-Dart (it pneumatically fires a dart, you see – in other words it’s a compressed air pistol) 190B breech-loading one-shot pistol. It’s a tranq pistol that looks much like what people expect a tranq pistol to look like. As above, firing a larger dart with more drug at a longer range. The values used in the stats are an even murkier compromise. These darts are generally loaded with the heaviest possible dose, but their efficiency in fiction is very much variable. Tranq rifles often cartridges of gunpowder to shoot the dart, and usually have an optical scope (often a x4). DCH Tranq rifle [BODY 02, Poison touch: 09, Range: 05, Ammo: 05, Telescopic vision: 02, R#02]. M&M Tranq rifle [Ranged Affliction 10 (Fatigued/Exhausted/Asleep), Resistible (Toughness and Fortitude), Diminished Range 1, Senses 1 (Extended visual)]. Below is a Dan-Inject model JM special (photo from the manufacturer’s website ) with its barrel extension on. Tangler, snare gun, entangler, net gun, gummer, goop gun, etc. These sci-fi weapons are common in comic-book universes. They all intended to entangle targets to neutralise them in a low-risk, less-than-lethal manner and are often employed by police and security systems meant to deal with superhumans. There exists “net guns” in the real world (4-bareled affairs that shoot 4 weights with a net between them), but fictional weapons are more often imagined as shooting a sort of soft ball that explodes in a mess of sticky tendrils, or even metallic cables that wrap themselves around the target. Some designs depict a weapon that discharges a ball filled with a sticky substance, or webbing much like Marvel comics’s Spider-Man’s. 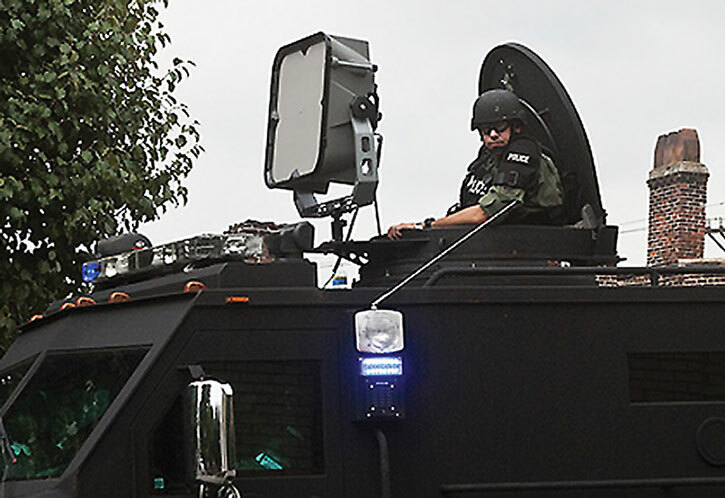 Real world weapons using this design (like the Foster-Miller Webshot or Stingray systems) do not quite work in the field, but the fictional equivalents have the problems all worked out. Like with tranq guns, how efficient tanglers are is very variable from one story to the next, and the stats below are a murky compromise. They are often pictured as riot gun-sized. DCH Tangler [BODY 03, Snare: 06, Range: 04, Ammo: 04, R#03]. M&M Tangler [Ranged Snare 7, Diminished Range 1]. Here is a quick imaginary design. 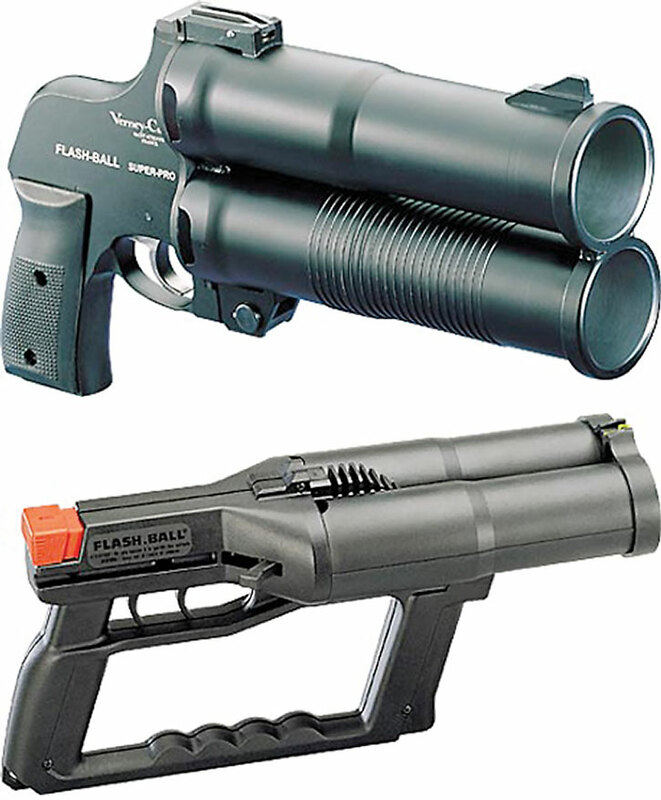 The flash-ball guns below would also work fine as props for a tangler. This less-than-lethal weapon is a compact, double-barrelled gun shooting a 44mm soft rubber ball. It is used to punch and stun civilians at ranges of about 15-30 metres, and the impact has been compared to being hit by a heavyweight boxing champ. Like all less-than-lethal weapons it is certainly not risk-free. Its heavy use by French police forces has resulted in a number of persons losing an eye. Still, in fiction, it can serve as a weapon for a vigilante with a code against killing. DCH Flash-ball [BODY 02, Projectile weapon: 04, Range: 02, Ammo: 02, Limitation: Bashing damage only, R#03, Limitation: Projectile weapon has No Range, use the Range listed instead]. M&M Flash-ball [Ranged Ballistic Damage 3, Diminished Range 1, Limited 1 (Two shots)]. A modern design for a less-than-lethal gun with varied ammunition. This gun uses compressed air to shoot specialised 18mm ammunition at a range of about 30-40 metres. The 303 is fed by a 15-shot drum magazine with a transparent rear to see the colour-coded ammunition, which on paper can allow to select a specific type of ammunition for a given shot. Like all less-than-lethal weapons the 303 is not risk-free, particularly for impacts that do not occur centre-of-mass or hit a sick or aged person. While the 303 is essentially an upgunned paintball carbine, it can kill. Ammunition include impact rounds (white), impact rounds loaded with tear gas (orange), impact rounds loaded with fluorescent washable paint (pink) and impact rounds loaded with permanent polymer paint (yellow). The goal of the paint is to mark a person who cannot be arrested right now so they’ll be easier to find later. Comic book vigilantes with a code against killing might use a weapon much like this one, quite possibly with variant or more powerful chemicals. Further, loading the balls with holy water rather than glycol or inert powder comes to mind for certain applications. DCH FN303 Riot Gun [BODY 02, Projectile weapon: 03, Range: 04, Ammo: 15, Limitation: Bashing damage only, R#03. Paint rounds add a Combined Colour: 04, tear gas rounds add a Combined Chemical attack: 04]. M&M FN303 Riot Gun [Ranged Ballistic Damage 1, Diminished Range 2. Paint round have a Linked Feature 1 (Paint) ; OC rounds have a Linked Visual Dazzle 4]. The first shot is from digitalparadox.com , by artist Chris Decker. The big thing on the side is the compressed air bottle. 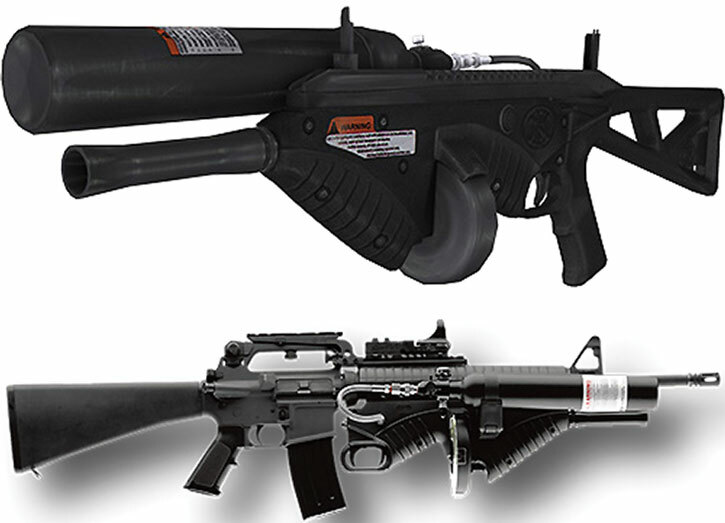 Note that this weapon can also be adapted to fit under the barrel of an assault rifle – the photo illustrating this solution is from the website of the manufacturer . An acoustic device that sends a focused wave of sound (usually a strident sound such as a car alarm blasted at 150+ db, or ultrasonics) over a large range. The larger such systems are not intended as weaponry, but to hail a boat you can’t establish radio contact with. The smaller ones are built for “pain compliance”, and are very much like a modern megaphone in size and shape. This is essentially a mass torture device to force people to flee in pain and is likely to induce permanent hearing loss, nausea and unconsciousness if the person cannot run. In fiction, a screamer will often be used to overwhelm the target and quickly induce unconsciousness. This is different from what we call a “screamer” here, as such a weapon would be a sci-fi stun ray using a “sonic” descriptor rather than a system forcing people to run. DCH Screamer [BODY 02, Aura of Pain: 05, R#03, Note: Aura of Pain is sonic and protections against those apply]. M&M Screamer [Cone-Area 3 Affliction 11 (Dazed/Compelled/Controlled, resisted by Fortitude), Limited 1 (Controlled is limited to making the person run away in pain), Quirk 2 (the Rank of Affliction is lowered by the ransk of distance between the emitter and the target), Descriptor: Sonic]. The stats above are for a large unit intended to disperse a crowd. In the real world it would be vehicle-mounted, though in fiction it could fit in a flamethrower-like backpack with a hand-held projector. For smaller, megaphone-sized models, halve the power. 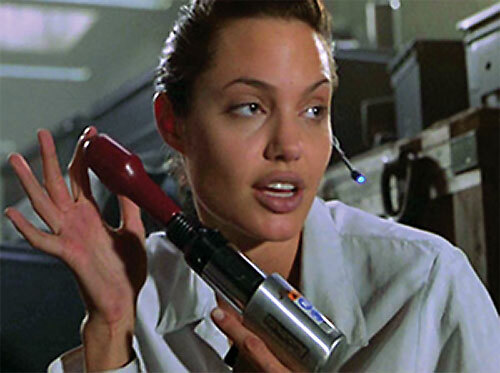 Helper(s): Roy Cowan, Chris Cottingham, Eric Langendorff, Azraelfl, Max, Darci and (allegedly) Angelina Jolie.